Coats for Kids is planned for October 20th at the Indiana State Fairgrounds from 8:00am-2:00pm in the Elements Financial Blue Ribbon Pavilion Indianapolis, IN 46205. Start gathering any new or gently used coats that you have! Donate! For every $25 donated, The Salvation Army is able to purchase a new coat in the most needed size. Click here to make your donation now. Follow The Salvation Army on Twitter and Facebook to learn of additional opportunities to donate coats and cash in support of Coats for Kids. Volunteer to help us set up the week before. Volunteer on distribution day as a shopping assistant. Volunteer on distribution day as an event assistant. CALLING ALL INTERPRETERS! Are you fluent in Spanish, Burmese, Farsi, or ASL? Some of our Coats for Kids families are have non-English speakers or deaf members who need your help. If you are bilingual and would like to use your special communication skills to help families at Coats for Kids, please reach out to Samantha Hyde at samantha_hyde@usc.salvationarmy.org. Thank you! 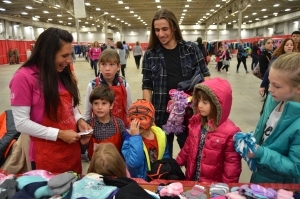 Last year, over 2,500 Central Indiana children came to the fairgrounds with their parents to pick out the perfect coat, hat, and gloves to keep them warm through an unpredictable Indiana winter. For the kids, this is a fun day when they can hunt for a coat they can wear to school with pride and confidence. From the tiniest of newborns to high school seniors, these children all need quality winter gear to help them stay healthy and warm. Since the most-needed sizes vary from year to year, in can take an inventory of over 4,000 coats to ensure that every child will find a coat to take home. While a winter coat may seem like a small gift, the Coats for Kids program makes a big impact on local families who are struggling to put food on the table and keep the heat on through the winter. By providing these coats for their children, parents are able to use their limited funds to pay for necessities like school supplies, food, gas, utility bills, and rent. Thanks to Coats for Kids, they don’t have to choose between equipping their kids for the cold weather and paying the light bill.